As a pilates teacher I’m well aware of how important it is to have flexible feet and to pay attention to the grounding and position of my feet… but the busyness of life meant I hadn’t been looking after the skin on my feet. Or to be honest my legs! My feet are always in use and they rarely get a pedicure, by rarely I mean like once a year. So I was pleased to try out Dr Anders range of professional foot care, perfect timing for summer. Now one of my big foot issues is the skin on my heels. It was pretty rough and dry. I wasn’t expecting anything much from a cream but you know, it’s worked. After a couple of weeks using the intensive rescue balm my heels are smoother and look better. The whole of my foot is softer. The cream is lightly fragrance and nice to use. I’ve used it morning and night for 2 weeks with good results. I did find I then needed to keep using it regularly for this to be maintained but the nourishing daily spray also helps with this. So if you are looking for a good foot range I’d recommend this one. Disclaimer: I was sent this product range to review, all views are my own. How my life has changed! Once upon a time I avoided PE lessons like the plague, hated getting sweaty and would never have gone to a fitness festival for fun! I did enjoy certain types of exercise but they were not the standard ones included at school. They were not accessible and I couldn’t just pop in somewhere to try things out. This is part of what Luke from Sweat Southsea made accessible at the Southsea Fitness Festival. Different forms of exercise were made accessible. From high impact to upside yoga, from power plates to a dualathon. It was truly fabulous and the best part, free and family friendly. Having this festival outside also meant that people could just walk by and take part, or just watch! I saw mums with newborns, pregnant ladies, gym bunnies in Lycra and older adults all soaking up the vibe. Highlights for me included taking part in the dualathon with my kids. Again, not something I would normally enter (though I am tempted) but so much fun to do this without the pressure being on. Thankyou Southsea for having us. We will be back. More of this please. Priya is the one to come to if you want to stay strong in pregnancy or need fixing after baby. She has worked with over 1000 pre/postnatal ladies and with a very high level of training you can be sure you are in safe hands. If Priya doesn’t know the answer she will know someone who can help. Our classes are small and focus on a mixture of using your core correctly, building strength in those areas you really need it for mummyhood, releasing tight muscles and Pilates movements that will really make a difference. If you are suffering with back ache, sciatica, pelvic pain, hip pains, shoulder issues or muscular imbalances then our pregnancy classes are focused on helping, so let us know what to focus on. Postnatally our classes are aimed to help rebuild you, using breathing, functional work, core strength, posture and pilates. All classes are safe if you suffer from diastasis recti or pelvic floor issues. At Pilates with Priya we pride ourselves on keeping our numbers low. We have a maximum of 8 people in our main Pilates classes, this means you get more support and input from the teacher. All our teachers are experts in their field, with a minimum of a level 3 Pilates qualification, we only like to take on the best we can. Any medical issues you have can be catered for. Priya personally works with any new teachers to help mentor them and as a team we like to keep up our own personal practice and learning. You will find our studio is welcoming, non judgemental, calm and “bijoux”. We use a variety of equipment including rings, bands, balls and rollers. Before starting classes with us we ask that you go on our introductory course or have a 1-1 induction session so that you have a good grasp of the basic principles before going into a class. We all know how amazing Pilates is, but also the huge, huge importance of a good diet. Life over here is hectic: 3 children, seeing my nutrition clients (in my role as a dietitian), running workshops, doing my business development, teaching classes and working with 1-2-1 clients…. phew. So I need meals that pretty much cook themselves but are nutritious and delicious. I must admit to being totally dubious when GSN offered to send me their chicken to try out. It arrived frozen, well packaged with 24 chicken breasts in the one bag. Each breast is easy to get out, they aren’t all in a large lump so you can literally get out as many as you need at a time. The bag does take a large amount of freezer space but my tip on that would be to decant the chicken into serving sizes bags and then pop in the freezer. This way you can stack the bags up and just get out one at a time. The chicken is steam cooked and can be cooked from frozen or defrosted and eaten hot or cold. I love the “no need to cook” aspect. I have grabbed this chicken out of the freezer, frosted in my mircrowave and added it to a stir fry to make a meal in 15 minutes. BAM. The important bit is the taste. Literally I was expecting a watery chicken, but it is juicy and meaty. The whole family were pleased. The only negative point I have is that the chicken is not free range but comes from a British Retail Consortium factory. Disclaimer – this post is a review, I was sent the chicken to try out. All views are my own. Can pilates help with mental health? People normally start doing pilates with us because they have a bad back, want to gain more core strength or are pregnant. However Pilates has more benefits than just the physical ones. 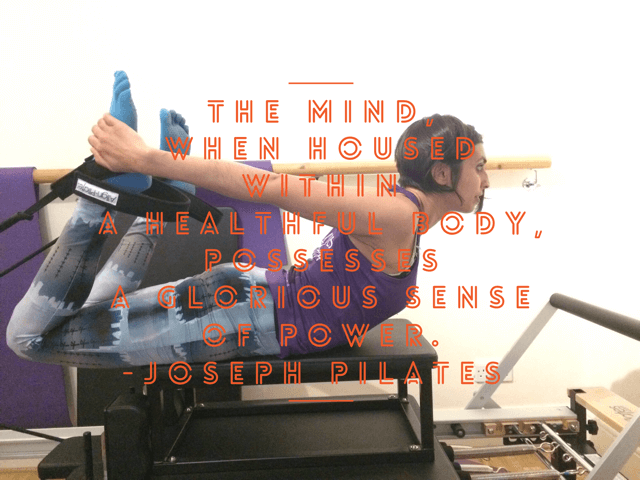 Joseph Pilates believed mental and physical health were closely connected and I think this is one area we need to explore further in this busy world where levels of depression are high. I know for myself, teaching Pilates is the best job. After a stressful time in my other work as a dietitian or as a mummy, I get to chill out in a relaxed, beautiful space and teach a calm, mindful class. Focusing on your breathing, your body movements and your muscles is part of mindfulness so you can instantly see why Pilates has more benefits than just the physical ones. One statement I heard this week was “I always sleep best on a Thursday after Pilates”. I can see why that is. Pilates helps you slow down your pace of life, move your thoughts from work, home and stress to your body and draw plenty of oxygen into your muscles, using deep, thoracic breathing. Mindfulness is a therapy that is being used for all kinds of mental health conditions now. A definition of it is: “a mental state achieved by focusing one’s awareness on the present moment, while calmly acknowledging and accepting one’s feelings, thoughts, and bodily sensations, used as a therapeutic technique.” It uses compassion and breathing to help you to let go of negative thoughts, stress and even pain. The similarities to Pilates are easy to spot. Even if you went to a Pilates class and did nothing except lie on the mat and breath you would feel some benefits for your mood and stress relief. So there seems to be an obvious link between Pilates and mental health. One thing I always want to know is what is the evidence? Has there been any actual research done? There is actually quite a lot that shows a link between Pilates improving your mood, lowering stress and helping with cognitive function. Look out for my next blog post that looks at the research.